Antonio Gramsci (Italian: [anˈtɔːnjo ˈɡramʃi]; 22 January 1891 – 27 April 1937) was an Italian writer, politician, political theorist, philosopher, sociologist, and linguist. He was a founding member and onetime leader of the Communist Party of Italy and was imprisoned by Benito Mussolini's Fascist regime. 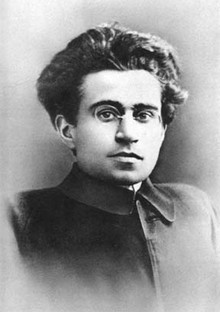 Gramsci was one of the most important Marxist thinkers in the 20th century. He is a notable figure within modern European thought and his writings analyze culture and political leadership called "hegemony". He is known for his theory of cultural hegemony, which describes how states use cultural institutions to maintain power in capitalist societies. ↑ Owen, Richard (25 November 2008). "The founder of Italian Communism had deathbed conversion". The Sunday Times. Retrieved 4 December 2010. This page was last changed on 22 January 2015, at 08:56.